Custom engraved game gift sets with your choice of decorative design and personalized text. 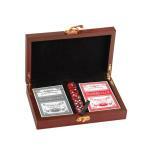 Poker sets, card & dice sets and more. Flowers, Hearts, Stars and more.